With every engagement comes a breakup. 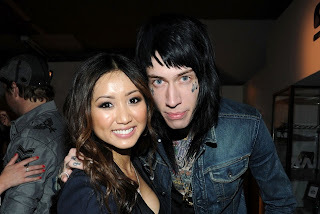 Just weeks after his little sister agreed to marry her Australian lover, Trace Cyrus announced his split from his fiancee Brenda Song. It was first announced that she was pregs and then they got engaged (wonder why...) and now it's over. Supposedly it has been over for months, but one can only imagine that with the younger sister just getting engaged the fact that the older weirder looking brother is also 'engaged' may come up. Guess it was just time to come clean. It was also revealed that Song is no longer pregs...and that she may have never been. Um, OK.